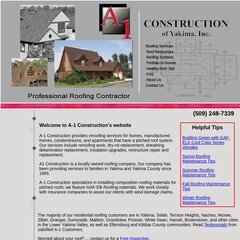 Topics: Spring Roofing Maintenance Tips, Summer Roofing Maintenance Tips, Fall Roofing Maintenance Tips, Winter Roofing Maintenance Tips, Free Inspection, and Roofing Services. ns99.worldnic.com, and ns100.worldnic.com are its DNS Nameservers. Monstercommerce Llc (Illinois, Belleville) is the location of the Apache/2 server. Its IP Number is 206.188.192.210.